A Bangor man is seeking the assistance of hunters this fall in an effort to help solve a family mystery. HOULTON, Maine — A Bangor man is seeking the assistance of hunters this fall in an effort to help solve a family mystery. Jerome Hogan said on Wednesday that he is asking hunters and hikers out in the woods to keep an eye out for the remains of his brother, Lewis “Billy” Hogan Jr., or his airplane. Hogan, who was a Houlton-based pilot, disappeared 46 years ago while flying on a stormy morning. 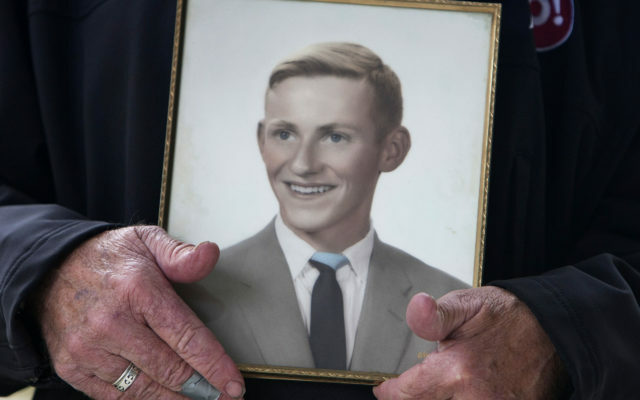 Hogan, 28, was working for LISAir when he left Danbury, Connecticut, at 8:15 a.m. on May 2, 1972, in a brand-new, yellow-and-white single-engine Citabria. He was expected to land at Houlton International Airport later that day, but communication was lost somewhere between Kennebunk and Augusta. Hogan was never heard from again, and search crews never found his remains or any trace of the plane. Search efforts have intensified over the last couple of years, however, since Jerome Hogan sought to renew interest in the case. He is hoping that the public will also provide assistance. Hogan was using a type of short-range radio navigation system known as VOR to determine his position and keep the aircraft on course. The system works by receiving radio signals transmitted by a network of fixed ground radio beacons, but on the day Hogan disappeared, the beacon at the Augusta airport was out of service for about four hours, according to the Maine Civil Air Patrol. Officials at the Federal Aviation Administration determined that the pilot called a mayday, which was picked up by the FAA tower in what is now the Portland International Jetport. In March of 2016, members of the Downeast Emergency Medicine Institute and Old Town Aviation Explorers Post 787, a development program for youths interested in aviation careers, partnered to search Mount Waldo in Frankfort for plane remnants or remains. That search was prompted by the memories of a Bar Harbor woman who was hiking Mount Waldo in 1978 or 1979. While she was hiking down the mountain, she got lost and came upon the wreckage of another plane that she believes could be Hogan’s plane. The Aviation Explorers conducted approximately eight searches in 2016, but they proved unsuccessful. Jerome Hogan said on Wednesday that he is grateful for all of the assistance he has received and will always continue searching for the brother he has not seen in 46 years. “I am not giving up,” said Hogan.